Swimmers continued to put up some strong performances in Marseille, with key athletes placing themselves in the finals across multiple events on day 2 of the Golden Tour Camille Muffat. Among them was Katinka Hosszu, who followed up her impressive 4:33.83 gold medal-winning 400m IM from last night with the top seeded 200m fly this morning. Clocking 2:10.66, Hosszu earned lane 4 and will be flanked by teammate Liliana Szilagyi, who touched in 2:10.99, as well as Spaniard Mireia Belmonte. Belmonte is the reigning Olympic champion in this event, but was well behind the top 2 this morning, finishing in 2:15.54 for the 3rd seed. But, the 28-year-old knew she also had the 800m free on the docket in the heats and planned accordingly. Belmonte took the top seed in that grueling event, touching in 8:34.32. Behind her was Aussie Maddie Gough, who has already collected 1 gold here in Marseille with her 4:10.98 performance in the 400m free last night. Hosszu also took on another event, reaping the fastest time in the women’s 200m IM ahead of America’s Kathleen Baker. Hosszu notched 2:11.98 to Baker’s 2:13.53, while Belmonte was also in the race for her 3rd swim of the night. Belmonte collected a mark of 2:19.91 for the 6th seed. 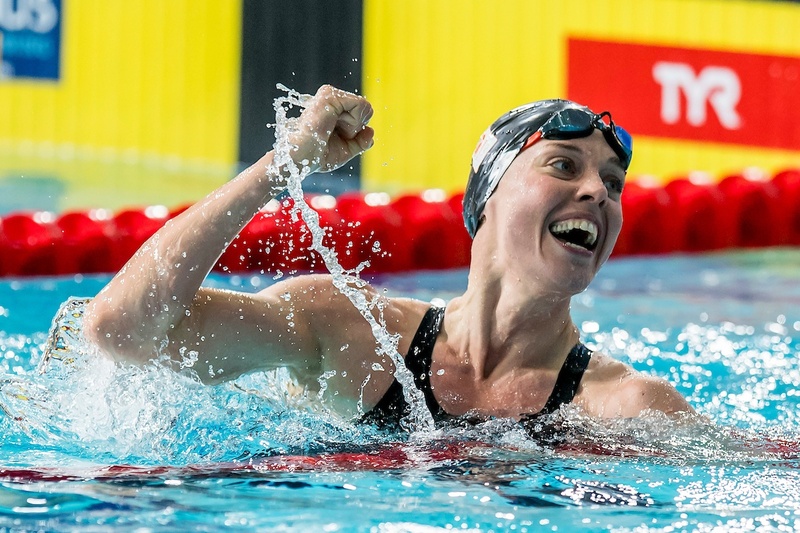 British swimmer Georgia Davies claimed the pole position in the women’s 50m back in 28.14, with Kira Toussaint and Baker right behind with morning efforts of 28.26 and 28.37, respectively. Baker already won the 100m back last night, clocking the fastest time in the world this season in 59.05. Ben Proud also gave the Brits a top seed, setting himself up as the man to beat the 50m fly. Proud produced a morning swim of 23.74, just .02 ahead of Dutch swimmer Mathys Goosen‘s mark of 23.76. Jeremy Stravius, Jesse Puts, Marius Kusch, Mehdy Metella and Chad Le Clos will all be in tonight’s final chasing Proud. Dutch swimmer Femke Heemskerk made her presence known here in Marseille, crushing the field in the women’s 100m freestyle prelims. Hitting her fastest time of the season in 53.58, Heemskerk notched the 5th fastest time in the world this season to take the top seed. French National Record holder Charlotte Bonnet was also strong this morning, clocking a mark of 54.61. Toussaint will also be in the mix, producing the 2nd fastest time of her career. Arno Kamminga took the top spot in the men’s 200m breaststroke in a time of 2:09.68, clearing the field by over 2 seconds. Teammate Tes Schouten did the same in the women’s edition of the event, clocking 2:33.59. Maxence Orange of France was the men’s 200m backstroke top swimmer of the morning, punching a time of 2:00.34. Hungarian swimmer David Verraszto took the men’s 400 IM lane 4 position in 4:20.48.